Wednesday’s Weekly Savings Tips: The Laundry Stain Hack You NEED To Know! This weeks Wednesday’s Weekly Savings Tips is on, Laundry Stain Hack You NEED To Know! Not sure what weekly tips are? You can read what they are about here. Have you ever had something drip on your shirt when you are eating? Or maybe got a grass stain from sitting in the grass? Do you have a hard time scrubbing and getting those stains out? 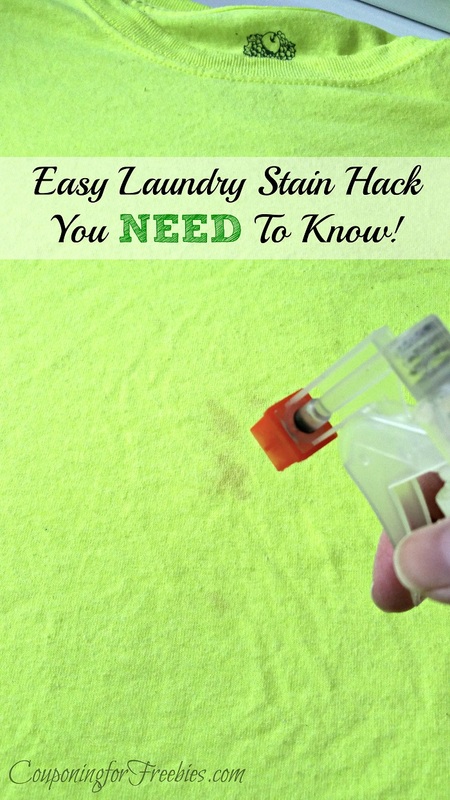 Well, I did too, until I found this laundry stain hack that you need to know about. No, it is not one of the really pricey ones or one of those stain sticks you need to carry with you wherever you go. The one I found only is $1! Plus it even works on set in stains! The next time you are at a Dollar Store, pick up a $1 bottle of Awesome. It is AMAZING on stains! You can buy it on Amazon, but it is a little higher there. You simply spray it on, let is sit for about a minute and then toss it in the wash as normal. If it is a fresh stain, it should come clean in the wash. If the stain has been sitting for a few days or is even something you have washed before, without Awesome and it did not come clean, it may take a few washes. Just treat the stain with Awesome right before each wash.
Be sure you do not dry your clothing until you are sure the stain is out. When you dry it, it makes the stain even harder to get out.